Organizers say at least 50,000 people are expected to be a part of the Women's March on Chicago this weekend, one day after Donald Trump's inauguration. The new number comes after the group revealed during a press conference Tuesday that 40,000 marchers had registered for the event with another 20,000 interested in attending. The demonstrators are expected to take to city streets after a morning rally, which will likely mean street closures in downtown Chicago Saturday as the group marches on a route beginning near the city's Grant Park and ending at Federal Plaza. Columbus Drive will be closed from East Monroe Street to East Balbo Avenue. East Jackson Drive, East Congress and Balbo Avenue will all be closed from Michigan Avenue to Lake Shore Drive. Monroe will also be closed from Michigan Avenue to Columbus, organizers said. 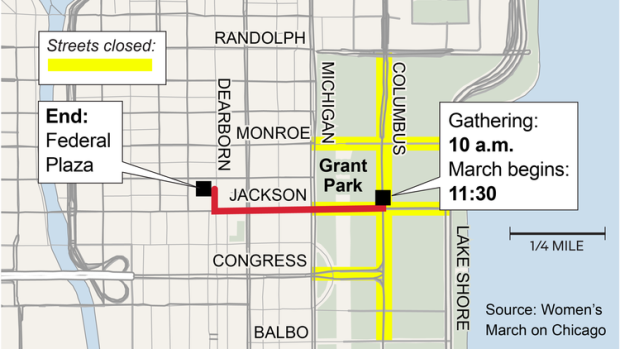 The march is expected to step off at 11:30 a.m. and continue west on Jackson Boulevard before ending at Federal Plaza. As of Monday, nearly $40,000 had been raised to fund equipment needed for the downtown event. Chicago police did not immediately respond to a request for comment on plans for security or potential traffic disruptions during the event.